The platinum jubilee celebrations of Doon School started with all pomp and show. Thousands of old schoolboys right from the 1946 batch along with their families had gathered from all over the world to participate in the celebrations. After the formal registration of the guests, parents of the students and old boys, it was in the evening that students presented “Andha Yug” a play by Dharamveer Bharati and directed by Hammad Farooqui. It would come as a surprise if someone told you that Doon School also has a history of admitting girl students. They are wards of staff who work and teach at the school. The inauguration of Art and Media School to be held tomorrow is a unique feature of Doon School encompassing the past history of the school and with an eye on the future. A former Chief Minister, Major-Gen Bhuwan Chandra Khanduri (retd), has said the need of the hour is to make younger generation take pride in our value-based system. Employees at the Kumaon Mandal Vikas Nigam (KMVN) are once again up in arms against the state government for “ignoring” the corporation. They are agitated over the failure of the state government to appoint a full-time Managing Director (MD) to the body in the past 10 months. Harish Rawat, Union Minister of State for Labour and Employment and Lok Sabha MP from Haridwar, on his visit to Mussoorie yesterday lambasted the state government over the allegations of inadequate relief being provided to the state. Rawat said the state government had not spent even Rs 6 for the disaster relief from its coffers but was demanding more from the Centre which was unwarranted. He advised Nishank to take a cue from the Haryana government and spend state’s money in addition to the relief from the Centre. MPG College student union president felicitates Union minister Harish Rawat in Mussoorie on Thursday. Under the aegis of the Indian Education Research Centre (IERC), Lucknow and Uttarakhand Technical University, three-day national seminar on bringing practicality in the age-old traditional education system started at the Institute of Engineers here today. The five-day training programme of the Forest Research Institute (FRI) for the 30th batch of the Indian Statistical Service (ISS) Probationers concluded here today. 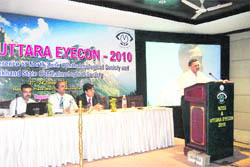 A three-day conference, NZOS and Eyecon, 2010, under the aegis of the Dehradun Ophthalmological Society started at Hotel Park Plaza today. More than 600 ophthalmologists will be discussing the reasons and cures of eye-related diseases. Eye surgeons at a conference in Mussoorie on Friday. The Department of Hydrology, IIT Roorkee, began a three-day Indo-Italian Workshop on the “Impact of Climate Change and Anthropogenic Activities on Soil and Water Resources.” The workshop has been organised in collaboration with the Italian Institution, CNR-Water Research Institute (IRSA), Italy through the Italian Embassy, New Delhi. The Ministry of Water Resources, New Delhi, has sponsored the event. About 35-40 Scientists, Hydrologists and Engineers from leading technical institutions of India & Italy will be participating in the workshop. Participants at the Indo-Italian workshop on climate change at IIT, Roorkee, on Friday. Haryana boys and girls excelled on the first day of the three-day All-India Invitational Rink Hockey and Speed Skating Championship being organised in the memory of Nand Kishore Bamboo and Naresh Aggarwal, skaters and referees of an international repute. 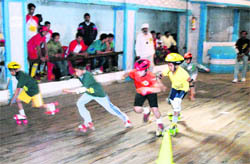 A speed rink race in progress at the All-India Invitational Rink Hockey and Speed Skating Championship in Mussoorie on Friday. The first Uttarakhand State Roller Hockey Cup will be the highlight of the XIV Doon District Roller Skating Championship that will be held on October 23 and 24 at Olympus High School, GMS Road. On the occasion of Balmiki Jayanti, a marathon was organised at Brightland School here today. As has been the case in the past four years, this time too, the whole town of Roorkee is going through a buzz of excitement for the preparation of the Annual Roorkee Marathon, organised by Bengal Engineering Group and Centre, Roorkee. Doon Star today entered the final to set up a summit clash with Football Hostel at the DFA Challenger Cup being played on the Pavilion Ground here. The final will be played at 3 pm on October 24. DAV (PG) College became the champions of the HNB Garhwal University Inter-Collegiate Football Tournament organised by SGRR (PG) College, Pathri Bagh, here today. The platinum jubilee celebrations of Doon School started with all pomp and show. Thousands of old schoolboys right from the 1946 batch along with their families had gathered from all over the world to participate in the celebrations. After the formal registration of the guests, parents of the students and old boys, it was in the evening that students presented “Andha Yug” a play by Dharamveer Bharati and directed by Hammad Farooqui. The venue of the play was changed due to a light drizzle in the evening. There was a nip in the air, but there was warmth among young and old Doscos who mingled with each other. Today, the main attraction were activities like rock climbing, yoga, chess and archery display by young students. The Pagal Gymkhana by old boys was enjoyed by one and all as young and old danced to the drum beats. Inclement weather forced the authorities to cancel the inaugural programme of the 75th anniversary celebrations of Doon School here today. Union Minister of Human Resource Development Kapil Sibal was to deliver an address at the inaugural function in the evening today. The Union minister, along with Chairman of the National Identification Authority Nandan Nilekani and senior journalist Karan Thapar had reached Dehradun today to participate in the Platinum Jubilee celebrations but before the start of the programme, a thunderstorm struck the Doon valley. The strong winds were followed by rains which continued till late night. 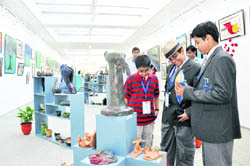 The programme which was scheduled to be held in the open was cancelled by the school authorities. President Pratibha Patil is also scheduled to arrive in Dehradun tomorrow to participate in the celebrations. Fleet rehearsals were done a day ahead of the visit of President Pratibha Devisingh Patil and King of Bhutan Jigme Khesar Namgyel Wangchuck. The two dignitaries will be visiting the 75th anniversary celebrations of the Doon School. Several rehearsals continued fro morning till evening before the weather played spoilsport. After the rehearsals, Garhwal IG MA Ganpathy, briefed the cops about the security arrangements. Security arrangements have been beefed-up ahead the President and the King of Bhutan’s visit. As per police, four companies of PAC will be deployed. Seven SPs, nine DSPs, 16 Inspectors/SOs, 104 sub-inspectors, four fire tenders and intelligence will be on duty tomorrow. No one will be allowed to enter without identity cards. Acting Superintendent of Police, Ajay Joshi, said, “ A total of 2000 police personnel will be on guard tomorrow. Stringent security arrangements have been made the places where President will be going”. Along with the old boys, these old girls were also a centre of attraction. Nandita Puri (1979 batch), a television actress, had a busy time along with her sisters (Chandrika and Kavita), who too had the privilege of studying at the Doon, courtesy their father TN Puri, who was a bursar in 1975. “I still remember my geography teacher Gurdiyal Singh. He made boring subjects interesting,” averred Nandita Puri. When it came to searching for a life partner, she chose a Dosco - Hindi film actor Inder Preet Singh Dhanoa, popularly called Dan Dhanoa. “I was in the Tata House and my husband was in the Hyderabad House (‘74 batch). He had a tough tackling mathematics that was taught by Sheel Vohra, who passed away recently,” added Nandita. Along with Nandita Puri, Himani Shiv Puri, daughter of Hindi writer Hari Dutt Shailesh, is a Dosco. Himani too is a popular film and television actress. Plus, there was RPN Singh, Minister of State for Road Transport and Highways and MP from Kushi Nagar, Uttar Pradesh. He was spotted with his family at the Pagal Gymkhana letting his hair down and taking in the music selection put up by a music jockey. A member of the class of 1982 and of the Kashmir House, the opportunity to catch up with his old pals was a temptation enough for him to come to Doon. A brain-child of the Architecture and Project Committee (APC), whose Chairman is Rohit Handa, its objective is to develop the estate preserving the old elements, keeping in view historical importance of the school and aspirations of students living in the 21st century. The two-story building encompassing 76,000 sq feet area dedicated to ceramic, digital, sculpture, textile, fashion designing, film making activities and also documenting history of the school. Besides, the APC is already involved in restoration and conservation of the school buildings. Already the restoration of the Tata House Master’s residence is underway by INTACH and also of the Residence of Imperial Superintendent of Forest of late 19th century that was later handed to the school. “The Tata House Master’s building, an amalgamation of the Indo-British architect, is built in brick and rubble, the masonry walls plastered with old-fashioned lime mortar, so a special chakki was set up at the school that was innovatly run on a three-wheeler for preparing lime mortar as no cement was used under the guidance of architect Vijaya Amjure,” said Piyush Malviya in charge, Public Relations, Doon School. Ample care is also taken of the murals and sculptures dotting the school done by Sudhir Khastgir, who was also an art teacher at one point in time. “Even the Rose Bowl Amphi Theatre has expanded and was redone in 2009, now it can accommodate 1,700 people,” said Samir Katre, Director, Administration, Doon School. Besides, the APC has also documented the arboreal heritage of the Chand Bagh estate, including its flora, birds and trees. It even has a horticulturist, who looks after the entire estate, assisted by Panchu, the gardener. “The project on new Art and Media School was planned in 2002 and work started in 2005 and was built at a cost of Rs 5 crore collected mainly through donations,” said Aloke Bhowmick Tirtha, Head of Art and Media School. He was speaking as the chief guest at Jagad Guru Kankhal Ashram as part of Acharya Kunwar Chandraprakash Singh Janamshati Varsh concluding ceremony. General Khanduri lashed out at the Mackaulay-based educational system which he termed as one of the factors responsible for creating differences in our society. Stating that the Indian culture and centuries-old knowledge based education is still the best, he said whereas the Western world was acknowledging our culture, tradition and immense spiritual-religious knowledge, we were inclined towards the Western culture which is paving way for degradation of our society and ethics. “We are forgetting our tradition, language and having an inferiority complex while at the same time attracted towards the Western culture which is not more than 500 years old in comparison to our time tested thousands years old culture,” said General Khanduri, who is a legislator from the Dhumakot assembly in Pauri Garhwal. Appreciating the work done inthe field of literature, language, education and research by late Acharya Kunawar Chandraprakash Singh, the former Chief Minister said the need of the hour was to bring to the fore such persons whose contribution to Indian society had been pivotal. Also present there were Shankaracharya Jagad Guru Raj Rajeshwaram, several other noted literati and BEd students from Munshi Raghunandan Prasad Sardar Patel Mahila PG College Barabanki, Uttar Pradesh. Girl students were quite elated to know about the Kunwar Chandraprakash and his contribution to literature. “Kunwar Chandraprakash wrote eight dramas, three Mahakavyas, translated Yajurveda and Atharveda in Hindi and carried out 12 researches, which is quite an inspiration for us,” said Rinki Dubey, a BEd student from Barabanki. They are peeved over the recent transfer of Managing Director AK Gosain within a span of one-and-a-half month of his appointment to the post. As of now, the post is once again being taken care of by District Magistrate Shailesh Bagauli. Talking to The Tribune, president of the KMVN Karamchari Mahasangh Dinesh Gururani said, “The government is simply ignoring the KMVN. We will launch an agitation if a full-time Managing Director is not appointed within a fortnight. We will not allow the Chairperson and the two Vice-Chairpersons to enter and avail the facilities in any of the KMVN premises in the region. We have sent a memorandum in this regard to Chief Minister Ramesh Pokhriyal Nishank”. The Nishank-led Bharatiya Janata Party (BJP) government, in its bid to appease its party functionaries, had recently gone in for appointment of Ravi Mohan Aggarwal as the second Vice-Chairman while ignoring the need of a full-time MD. The taking over as the new Vice-Chairman by Aggarwal had not gone down well with the employees who had vociferously opposed the appointment. The Nishank government was charged with burdening the KMVN with “non-productive appointments”. The employees have been openly criticising the political appointees for enjoying the freebies in terms of free transportation, stay and food at the KMVN properties. They have been pointing out that the same government cannot give a full-time MD who will work and deliver results. In fact, Aggarwal was allowed to start functioning after a promise was made that a full-time MD would be appointed soon. Gosain was appointed only to be removed in less than two months. The post had fallen vacant with the death of Haritash Gulshan, who had brought about major reforms in the functioning of the KMVN and had not only brought it out of the red, but had also helped it record substantial profits. His tenure at the KMVN was marked by the corporation registering an increase of 30 per cent in its profits. He had helped his employees get the benefits of the Sixth Pay Commission. The paying guest scheme was launched by him for promoting tourism and is turning out to be popular amongst entrepreneurs. Since his death, the KMVN had District Magistrates of Bageshwar and Nainital as MDs for whom running the KMVN has been an additional responsibility. Rawat was speaking at a meeting held at the Congress Bhawan near Jhoola Ghar yesterday. Addressing party workers, he said the Centre had provided interim relief and was contemplating on more aid to the state, but the state government was terming it as “cumin seed in the mouth of camel”. Regarding the claims that the Central guidelines for disaster relief were not in accordance with present times, Rawat said those guidelines were formulated during the NDA regime. Moreover, the state was empowered to add to its pool of money to provide relief, but the state government was not interested in doing so. Meanwhile, the Union minister heard the woes of the citizens of Mussoorie at Imperial Square where Mussoorie Forum members raised several issues regarding the town. Nitin Mohan welcomed Rawat and apprised him of the activities being undertaken by the forum to make the town a better place for tourists and residents. The members of the forum demanded a relief package for the tourism industry which was in deep crisis due to the recent disasters and no business being generated due to Commonwealth Games. Forum president Sandeep Sahni demanded that luxury tax and interest holiday should be provided to the tourism industry to which Rawat said he would also raise the issue at the appropriate platform. Secretary of the forum Shalab Garg and president of the Mussoorie Hoteliers Association RN Mathur raised the issue of connectivity to Mussoorie from other metro towns, saying that it was a major bottleneck in the development of tourism as there were no direct trains to the city from the metros. Palika President OP Uniyal raised the point of rail network, saying that it would also ease the traffic problem. MLA of Mussoorie Jot Singh Gunsola commended the effort of the forum and said the suggestions and inputs that had been provided at the forum would go a long way in improving the town infrastructure immensely. Former Palika President Manmohan Singh Mall demanded that the most of the area being used by the Survey of India should be transferred to some other department as very few employees were using the site. He suggested that if the site was given to an institute of repute then the town would benefit immensely from it. Harish Rawat said as tourism was a business of uncertainty the need to look for permanent sources of income for the town was justified. Rawat also suggested that a high altitude sports academy could do well in the hill town of Mussoorie. Later speaking to the media, Rawat said housing was the main problem of Mussoorie and he would raise the matter with the government at the Centre as well as in the state. He said the guidelines set up by state that 70 per cent employees would be employed by the industry from the state only was also not being followed. Regarding the bonded labour practice still prevalent in the state, he said his ministry was ready to provide more funds for survey and to assess the number of such cases. Rawat was felicitated at Mussoorie Postgraduate College later where students demanded a hostel for OBC/ST/SC students besides inclusion of several technical courses in the college. The programme commenced with the inauguration ceremony by chief guest Chief Minister Ramesh Pokhariyal Nishank, who expressed his concern for the prevailing conditions in the education system. He even laid emphasis on the traditional teaching method followed in India, where teachers had great significance in molding up a student’s career rather than commercialising the teaching method. “We are happy and proud to have finest engineering colleges and business schools in our country that has worldwide significance. While these educational institutions have given commendable gems that have added to the glory of our country,” he asserted. A large number of people from different states have gathered to participate in the convention. The entire programme is divided into six technical sessions, two on each day, with practical knowledge as well as presentation of research papers by the experts. While addressing the convention, Dr Jagatpal Singh Tomar, IERC, informed about the aims and goals of the organisation. He has also appealed to the gathering to promote a healthy and sound environment of education. Chief guest at the valedictory session Dr SS Negi, FRI Director, handed over the certificates to the participants. He hoped that the participants would now be benefited much from the gruelling training sessions. “This training will further guide you in your future works,” said Dr Negi. Dr Negi also informed that the FRI keeping up with its commitment to provide best of training on all aspects of forestry, another four training programmes on wood seasoning will begun on October 25. He said personnel from Mumbai and Kochi dockyard of the Indian Navy would participate in the programme. Meanwhile, FRI Head Extension Dr Jaishri Chauhan said the ISS probationers had been highly benefited from the programme, which provided in-depth training to the participants. Senior FRI officials Gulab Singh, Dr SPS Rawat and Sarvesh Singhal were also present at the valedictory function. On the first day, Dr VK Tiwari, Dr JS Thind, Dr BK Oli, Dr Sanjeev Mittal, Dr Ashish Nagpal shared information on correct use of lenses to cure eye problems and the different types of multi-focal IOL’s, their indications and case studies. Ophthalmologists were of the view that the new technology should be absorbed with immediate effect to increase relief for the patients. The executive committee also discussed the future activities of the society. Organising secretary Dr BK Oli informed that the society had invited senior doctors from the northern states to elaborate on the new developments in the field of ophthalmology. More than 151 papers were expected to be submitted in the conference. The conference would provide a platform for eye specialists to gain knowledge through discussion. Dr Oli said adequate facilities were integral for working in villages. President of the Dehradun Opthalmological Society and senior eye surgeon from Doon Hospital, Dr BC Ramola said trachoma could lead to corneal blindness. This was revealed through a pilot project survey carried out by the Government of India this year. Dr Ramola said a school located in Pauri district was selected for the study and it was found that many students were suffering from trachoma. “Trachoma is a contagious disease and its affects start slowly with itching and red-eye, which leads to corneal blindness. The disease is now curable and the best way to avoid it is by washing the eye twice a day. Changes in lifestyle and increased use of screens like computers and television lead to increased stress on eyes. The most effective preventive measure is lesser use of screens and incorporating correct computer positions. A minimum of 6 hours sleep is essential for enough eye and brain rest ,” Dr Ramola said. Dr Ramola added that the conference was being organised keeping in view the “20:20 Right To Sight” started by the World Health Organisation. He will be awarded for his exemplary service in the field of ophthalmology. Dr KK Mehta from Mumbai will be the chief guest at the conference. The Italian group includes 11 Italian researchers from the Institute of Environment Geology and Geoengineering, Rome and the Italian Embassy in New Delhi. The Indian group includes 15-20 leading researchers and policy-makers serving in National Agencies like Central Water Commission, Central Ground Water Board and National Institute of Hydrology along with academicians from educational institutions like IISc (Bengaluru) and the IIT’s Kanpur, Kharagpur, Roorkee, Guwhati, NEERI (Nagpur), NGRI (Hyderabad) & IITM Pune. The main themes of the workshop includes climate change modelling, its impact on surface, ground water resources, carbon sequestration, geological storage of carbon dioxide, soil and water remediation and human capacity building. Sri G Mohan Kumar, Additional Secretary of the Ministry of Water Resources, New Delhi, inaugurated the workshop. Prof Lidia Szpyrkowicz, Scientific Attaché of the Italian Embassy, New Delhi, is the Vice Patron. Prof Himanshu Joshi, chairman of the workshop, mentioned that the participation was by invitation only. Prof M Perumal is the convener of the workshop. In the under-6 boys rink race category 1, Kartik Jindal from Panchkula, Haryana, bagged the gold while Parvdev Sharma bagged silver. Yuvraj Chauhan from Mussoorie had to settle for bronze in a keenly contested event today. In the girls rink race category 1, Ananya Muni from Karnal bagged the gold. Earlier, the championship was inaugurated by local MLA Jot Singh Gunsola in the presence of State Roller Skating Association president A Rab, Rajendar Panwar and Palika president OP Uniyal. The highlight of the show was the artistic demonstration by six-year-old skater from Delhi Chirag Gupta, who, on skates, performed a stretching exercise in which he squeezed through the wooden blockade lit with candles that kept the audience gasping for breath. Several rink races were also held today. The participating teams from Haryana, Punjab, Delhi were immensely pleased to be in Mussoorie and praised the infrastructure at the rink. Haryana coach Chandar Singhal said Haryana was fast emerging as sporting state of the country which was evident from the success in the Commonwealth Games. He said states like Uttarakhand could become a sporting hub provided the government initiated a sporting policy and promoted athletes diligently. He said a number of boys in his team like Gaurav Bishnoi and Shubam had represented the state in the national level and hoped to do well in the international level too. The Uttarakhand Roller Skating Association president said Mussoorie had a glorious past in organising such championships and this tournament was being organised to honour stalwarts like Nand Kishore Bamboo and Naresh Agaarwal. He said as the hiring charges of the rink were on higher side, an international roller skating rink should be made at the Town Hall which would benefit the state immensely. According to organising secretary Karan Chauhan, more than 300 skaters from all over India will be competing in various disciplines - quads, in-line and road race - in different age groups for three days. He said this year, some players, who had won medals in the international arena, would also be participating to enhance the level of competition. The main objective of the championship was to promote and revive the skating spirit in Mussoorie. Roller hockey matches will begin tomorrow. A total of 275 participants will take part in the tournament. The other two categories are Artistic Show and Speed. The selection of the Uttarakhand team for the School National Games in Delhi and the 48th Nationals being organised by the Roller Skating Federation of India at Vizag will be done during the competition. The championship will open at 4 pm on October 23 and close at 6 pm on October 24. About 450 students from the classes VIIIth (5km), IXth (6km) and XIth (7km) participated in the race. Chinmay Chatterjee, Shivani Raturi and Suramaya Gosain got the first, second and third place, respectively, in the class VIII girls competition. In the boys section, Sagar stood first. Min-K-Thapa and Vaibhav Pant got second and third place, respectively. Sushan Srestha, Rishita Shukla and Priya claimed first, second and third position, respectively, in the girls’ ninth class race. Prashant Chahal, Prakhar Gupta and Mukul Negi got first, second and third place, respectively, in the boys section. In the girls class XI competition, Harshita Lal stood first. Riya Kalra got second place and Garishma Dasmana had to satisfy herself with the third place. Kartik Gupta was the champion in the boys event. Akashy S Bisht got the second place while Raghav Sethi and Suyash Rawat shared the third place. Winners were given prizes by Principal Pushpa Thapliyal. Sujata Banerjee, head mistress of middle school, Ritu Gupta, head mistress of junior school and organising secretary Romila Berry were also present on the occasion. This mega event will be held on October 24 on the Group Pavilion Ground. It is being a full marathon of 42 km for participants above 18 years of age and a half marathon of 21 km for 18 years and below. Women and children have a separate category called dream run or run for fun, which will be 5 km long, is open to all categories of competition. An exciting new feature of the Roorkee Marathon this year is the veterans’ run, of 6 km for the “young” senior citizens above 45 years in the city. With prizes worth Rs 1.5 lakh being given out and Rs 30,000 alone going to the first position of the full marathon. With a participation of over 200 Army personnel and a number of civilians, including school representatives last year, the organising committee hopes for a huge turnout of people this year. Health is wealth, keeping this in mind, BEG and Centre, the organising committee of the event, invites all to participate in this marathon. Entry forms can be obtained from BEG and Centre headquarters for Rs 100. Queries can be looked after by contacting 9258052933. In today’s second semifinal, Doon Star got past Sarvodaya 2-0. Although the latter gave good competition to Doon Star, but two late goals took the game away from them. The first half went goalless. Rajesh Chauhan (55th) and Yogi (60th) of Doon Star netted a goal each in the next half to fashion the win and help their team register a final berth. Yesterday, Football Hostel had defeated New Gypsy Club 1-0 to enter the final. 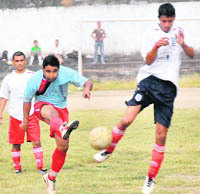 DAV beat Shri Guru Ram Rai (PG) College 2-0. Anurag (15th) and Arpan (40th) were the scorers for the winning team. Both halves had a goal each for DAV. Meanwhile, players were given away prizes at a prize-distribution ceremony. Team for Inter-University Competition to be held in Meerut on October 28 was also selected during this competition.